« Should the United Nations Have the Power to Impose Global Taxes? Lots of people were amused by the cartoon I posted yesterday, and I also got further appreciative comments about the video portraying Somalia as some sort of libertarian nirvana. And since readers are sending in lots of good material, I’ll continue to share the really good jokes and cartoons. Is this latest cartoon a false reading of libertarianism? Of course. But it’s funny since it takes a core truth (individual responsibility is good) and turns it into a caricature (you’re on your own, regardless). And just to show that I’m not becoming a soft-headed statist, here are links to some of my favorite jokes mocking leftists. Obama watching the Super Bowl (first posted in 2010, but very appropriate for today). How a leftist defends himself from charges of embezzlement and malfeasance. My personal favorite, showing the inevitable consequence of big government. A cartoon exposing the silliness of Keynesian economics. Some superb parody of Obama’s college transcript. Why nymphomaniacs should marry people from the government. And an image from the Beijing Olympics showing how communists can be efficient. I figure that nobody can question my philosophical bona fides if I provide eight anti-leftist jokes for every anti-libertarian joke. Addendum: A reader reminds me of this real-world example of government lifeguards. Man my back is hurting from working for all these libertarians internet commandos to sit at home and whine. I wish my “white privilege” would kick in. Libertarians are so funny. They keep poking fun because Republicans and Democrats keep voting the same way and expect different results…….. and libertarians keep repeating the same inane message. 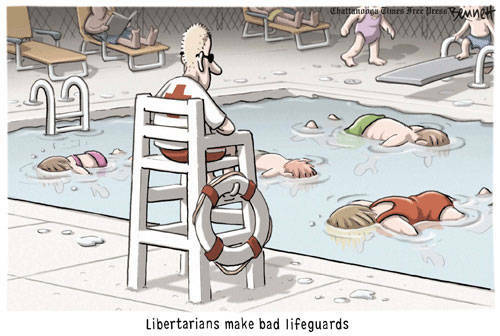 A comic that showed true Libertarianism would have no life guard and *maybe* a sign stating that there is no lifeguard on duty. Then there would be at most one body floating in the water because the next three would realize that they needed to take responsibiilty for their own actions. Taking the anectodal evidence of all the guardless hotel pools I swam in as a kid, there would not even be the first one. I’m pretty sure that the cartoonists’ own political party would be more responsible for a situation where a person had the right to be hired as a lifeguard even if he were blind. And, of course there are now fewer pools in the world because that same party has decided if a pool owner does not want to pay for accessibility, then nobody can use that pool. Also eight anti-wacko extreme rightist jokes, too, please! Apparently statists do believe that on some level. They believe that there will be chaos without a large level of government oversight. There is very little truth in these libertarian jokes…at heart is the conclusion that people are just too stupid to take care of themselves. This is the entire basis for support of a large-scoped-government. Without it, we will die. This is reflected in my college textbooks. They continually point to how government takes care of us in so many ways and how it is vitally important. Right… because in a world with less government, lifeguards would be paid to not do their jobs. Do people think the sun won’t even rise unless the government orders it to? …though the latter is probably not even watching… he’s drinking ouzo at the bar. LOL thanks for sharing the lifeguard cartoon!